The Nations Capital Marathon and Half Marathon, now taken over by Competitor is now a part of the Rock and Roll series, was a fantastic race especially for my first one ever. The race took place in March on a Sunday morning at the end of the month. This year it was still in march but a week earlier and very warm. Because of the time of the year and it is DC, you need to prepare for the temperatures ranging anywhere between 30 and 50 degrees. I was truly a lucky one because it was 30 degrees at the start of the race, colder than it had been all week. The expo was ridiculous and huge and definitely overwhelming for a newbie to the racing circuit. Thankfully I had a friend and fellow runner/triathlete there to teach me the ropes and introduce me to bib pick up as well as the companies and products present at the expo. I swear I could have spent hours there because there was so much to look at and acquaint myself with. I loved this expo and this race however as in any situation, it had some negatives, but to start off the perks. Perks- The course has you run all throughout DC’s famous neighborhoods. Starting off at RFK stadium, you head towards the capital building and along the national mall. You are running in the heart of our nation’s capital and get to see many landmarks such as the White House, the Washington monument and under DuPont circle. But the best part are the crowds. It seems like all of D.C. comes out to watch you run. Instead of having certain cheer locations like certain races do, everyone is along the race route cheering you on. They also offer massages to rub down your legs after the race is over. The first half of the marathon, I would have to say is the most beautiful and as someone who has lived in D.C. the first half of the race is the best. The second part has you run throughout southwest and southeast dc and I would say, it isn’t the most glamorous. But I enjoyed the race and it was perfect for my first one. Ehh… Not a Fan– If you intend on driving in for the race, prepare yourself by giving yourself, at least, an hour and a half to two hours to get to RFK stadium. If you take the metro I’m pretty sure it opens an hour before the start. D.C. police did a very bad job of blocking off the roads to get to the start. We left with plenty of time to get there but because traffic in DC was so bad, unfortunately, my mother and I found ourselves 20 minutes until the start of the race, trying to find parking on a random street nowhere near the start line. So instead of giving ourselves time to stretch and relieve ourselves, we were running the mile or so to the start line with many other individuals who were caught in the same traffic and were forced to park on a side street. Other than the traffic situation, mile markers were scarce, I’m pretty sure I only saw the 10k marker and mile 10. But other than that, the race ran very smooth. 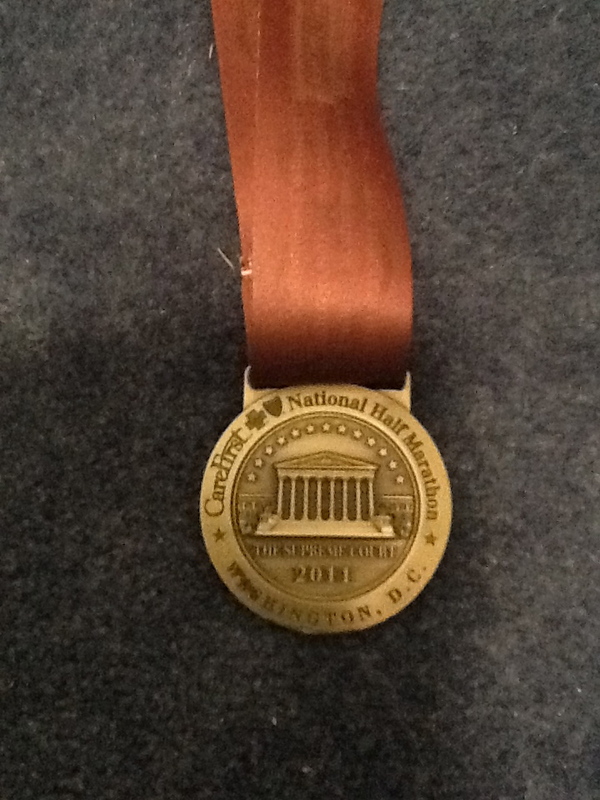 So if you would like to join the thousands running through our nation’s capital and want a pretty shabby medal, then do it, but prepare yourselves in advance of getting to the start line.